With mp3Tag Pro you can process tags of your music files in many ways. For example, there is a feature to download missing tags from internet services, such as Amazon, MusicBrainz, FreeDB, Discogs. Tags can be added or edited manually. It is possible to extract tags from filenames and folder names, import them from a text file, and more. The tag editor supports all popular audio formats: MP3, FLAC, APE, M4A, MP4, AAC, OGG, and others. On the other hand, information from tags can be used to rename your audio files. Let's see how we can rename MP3 files (other supported formats are renamed in the same way). This feature is similar to generating tags from filenames. As first, we have to select MP3 files that need to be renamed. In the "Folders" area on the left, select the folder with your MP3 files. The files will appear on the right. Click the green checkmark button to select all files. Alternatively, you can press Ctrl + A. To select an individual file, just click it. Like in Windows Explorer, you can use combinations Ctrl + click and Shift + click. In the lower part of this window, you can see two important columns. The "Before" column shows current filenames, the "After" column is a preview for future filenames, using the currently specified format. This is exactly how our filenames in the "After" column look like. You can click the "Rename files" button to rename the MP3 files. We can select a different pre-defined format from the "Format" dropdown list. Existing formats can be removed using the yellow minus button. You can also add your own formats to the list by entering a format and clicking the green plus button. Creating new formats is pretty easy. Think which field you'd like to use in your filenames, look up the variable for the field in the list next to the "Format" field and place it into the "Format" field. A preview will be available immediately. Let's do something that is not available among the pre-defined formats. We will rename our files to the pattern used on CDs: Track01, Track02, etc. Is it possible? Such filenames consist of two parts: "Track" is always the same for all filenames, while "01", "02" are obviously track numbers that are different for each track. Different means variable. This gives us the idea to look up the "Track #" variable in the list. By the way, it is at the very top: "Track # (%#, %0)". As you can see, variables are replaced with values from corresponding fields, while non-variables ("Track" in the first example, brackets and space in the second one) are kept in their positions. For more information about the "Format" field, read this article. All changes are applied only to the "checked" files. Near each filename, there is a box on the left. If the box contains the green checkmark, the file is "checked", otherwise it is not. By default, all files are checked. You can change that by unchecking some boxes manually, or using the buttons just above the list, in the upper left corner. It defines how information from ID3 tags will be processed. By default, there is no change, but you can convert existing values to lower or to upper case, or use further options. Using it, you can easily replace spaces with the "_" character or the other way around. Additionally, spaces can be removed. For example, if there is a title like "Some song", you can rename the file into "Some_song.mp3", replacing spaces with "_". This may be useful for systems that do not like spaces in filenames. Delete bad letters. Some characters are not suitable for filenames. If you try renaming some file in Windows and enter such character (for example, ":"), the system will show a popup hint saying that such character cannot be used. 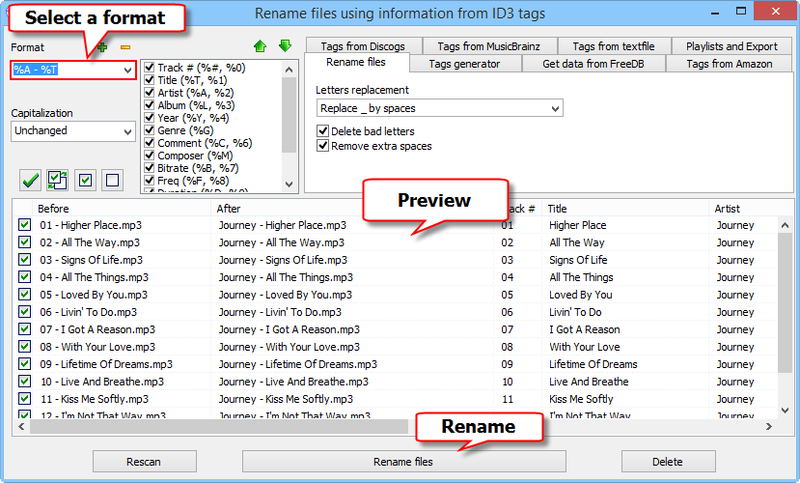 When creating new filenames from tags, mp3Tag Pro can either replace such characters with spaces or remove them completely. Remove extra spaces. If there are double, triple and so on spaces in tags, mp3Tag Pro can remove them. Normally, such filenames will look better, but if you want to keep spaces, disable this option. You can adjust the filename manually. The file renaming feature can also be used to create folders and sort audio files.